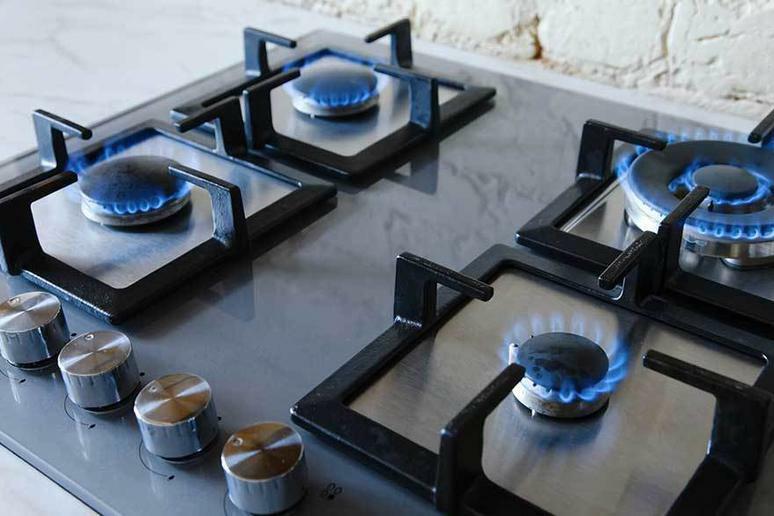 In general, gas ranges are built to accommodate natural gas. However, some models can be retrofitted with a manufacturer-approved adapter kit so that they can work with propane or bottled fuel. Gas ranges provide excellent control and adjustment of cooking temperatures. As gas ranges have continued to grow in popularity, the number of choices on the market has exploded. Today's gas ranges have anywhere from two to five burners and sometimes include a dual fuel option, which allows you to use electricity as well. We're here to help you narrow down your choices to a model that meets your specific needs. Our guide outlines the important features to consider when shopping and includes our top three gas range recommendations. The layout of your kitchen will determine whether you need a freestanding or slide-in gas range. Freestanding gas ranges have four finished sides and may or may not include a backsplash. These models are typically used in central kitchen islands. You have to make sure the gas lines reach where you'd like to place the range before installation. However, a professional can move the gas lines if necessary. Slide-in gas ranges have two unfinished sides that cannot be seen once the range is installed. These models slide into a 30- to 42-inch space that's flush with countertops. The space should already be prepped with a fuel line and ventilation system before installation. You'll need to measure the available space to make sure the range will fit. Small gas ranges meant for apartments or townhomes may only have two burners. The largest home models have five burners, and commercial-grade ranges have six or more. Ranges with five burners often feature one burner with a specific purpose, such as a low- or high-heat burner or one that's large enough to accommodate a griddle. Extra burners increase the price, so if you don't do enough cooking to warrant that many options, stick with a less expensive model with features you'll use. You'll also want a gas range with a sealed burner system. These systems protect the central burner from food and liquids. A gas range's capacity can range from two to six cubic feet. If you cook full meals for a big family, a large-capacity model will let you cook a roast and several side dishes at once. Base the capacity you need on the kind of cooking you do and the number of people you usually cook for. The BTU rating indicates how much heat the range puts out. A higher BTU rating means more heat. To provide more cooking options, each burner on the range may have a different BTU rating. A typical gas range has burners that start at around 5,000 BTU, and a few may have burners that go as high as 22,000 BTU. Ovens typically range between 9,000 and 15,000 BTU. Two-burner gas ranges start at around $150. Large ranges with five burners or more can come in at over $2,000. Overall, the price depends on the range's capacity and BTU rating. Overhead hood ventilation: Overhead hoods include an electrical fan system and require exhaust ductwork. They can be pricey, but they also offer the best protection for ceiling and walls. Downdraft ventilation: Downdraft ventilation systems pull smoke and grease through a filtering system underneath the range. This type of system accommodates kitchens that don't have room for an overhead hood. Microwave ventilation: Microwaves with a ventilation system save space and money. They don't work quite as well as an overhead hood but prevent ceiling and wall damage. Q. Do gas ranges reach temperatures high enough to damage my cookware? A. Only gas ranges that reach 22,000 BTU could possibly damage thin cookware. However, that much heat is only found on high-end models, and the majority of cast-iron and aluminum cookware can take the high temperatures of any gas range. Q. Why should I choose a gas range over an electric model? A. Gas ranges offer better heat control. The burners are instantly at temperature once the pilot light is lit. Gas ranges are also better for making incremental temperature adjustments. Our take: A gorgeous gas range with convection heat and a burner configuration that gives you plenty of options. What we like: It looks beautiful, cooks well, and is roomy inside. The self-clean function can be tailored to your needs, and the convection function offers several options. What we dislike: The exterior can get too hot. Our take: This Kenmore gas range has a lot to offer in terms of features and cooking space, yet it doesn't have an outrageous price tag. What we like: For the home cook who never has enough space, this range has five burners, including a simmer burner for low-temperature dishes. We also like the even cooking provided by the convection fan. What we dislike: A few users have reported a strange smell coming from one of the burners. Our take: This gem of a gas range has coveted features like a stainless-steel exterior, blue porcelain interior, and convection heat. What we like: The cooking grates are cast iron. The window is extra large so you can easily monitor your food. It has a nice feature set for a freestanding range. What we dislike: It's pricey and not as large as some other options.